Songs Tell me why I can’t seem to face the truth / And I really don’t know what to do / I’m just a little too not over you, not over you…. As a David Archuleta fan, those words will stand the test of time. I will forever be a fan and “a little too not over” David. 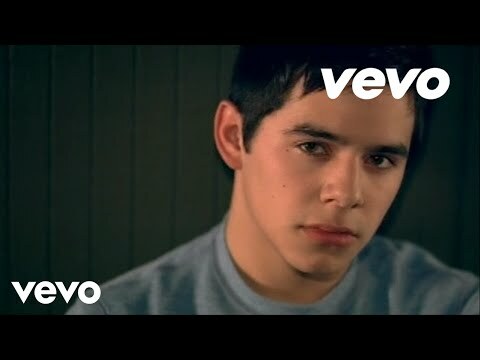 As the Billboard reviewer wrote, “Archuleta will touch hearts as he breaks the charts.” Chosen as the second single from his eponymous debut album, “A Little Too Not Over You” was co-written by David. Purchase the album, David Archuleta, on Amazon. And this is the song that has all the fans a-buzzing on all the message boards and blogs. Scheduled to be released as his next single, this song truly has it all. It is wonderfully composed by David Archuleta and friends and impeccably produced. David’s voice, right from the outset, sounds energetic and buoyant – as one of the composers of this song, he is obviously very connected to both the lyrics and the music. There are some wonderful harmonic progressions in this song, especially in the refrain on the word “truth”. David’s vocals sound expressive and transparent – lots of superb phrasing elements throughout this number that highlight the lyrical and melodic elements of this number. I love David’s head voice swimming over the orchestral refrain during the 2:06 -2:21 segment that follows the bridge. David’s voice sounds so darn beautiful and he emits his vocal sound with expressive ease and elasticity. This song screams “mucho hit” and the stuff of Grammy awards. This is most definitely one of the strongest songs on this CD –both the words and the music are truly inspired and just perfect for David’s artistic gifts. Bravo! The soulful “A Little Too Not Over You” follows David Archuleta’s No. 2 Billboard Hot 100 breakout ballad “Crush.” “Ay ay ay” chants cement the track’s chorus, and a sweet acoustic strum and floating melody deliver a fitting contrast to the “American Idol” runner-up’s soulful conviction, while a climactic falsetto at the bridge takes this one home. Here is the voice of a new generation: With his emotive pop consistency, Archuleta will touch hearts as he breaks the charts. David Archuleta has debuted a music video for his brand new single “A Little Too Not Over You”. On the Scott Speer-directed video, he is seen sitting in a dimmed room watching his pictures with ex-girlfriend through a digital camera. Read about “ALTNOY” on Katie’s “Song of the Week” column, written on 10 May 2010. Listen to last week’s Song of the Week. Wonderful song! This brings back really great memories when I first watched this video. I just loved all that rain with David belting out this song. You could tell he meant every word of this song…just watching him. We were so lucky to get to see this! Thanks Minja for posting this great video. David sings “I just can’t make up my mind” and follows to the end with the question unanswered. Will he or will he not Delete All? Will he ever get over his first true love? Will he ever find another? Where/how can he find the same happiness? So many questions…do they really need to be answered? David, as a young seeker, has so much to say in his songs, and I believe he’ll find a way to say it all, answering a few of our questions along the way.